Speaking of Pearl Harbor, I found this video rather interesting: http://www.brasschecktv.com/page/746.html. Something is not right here. 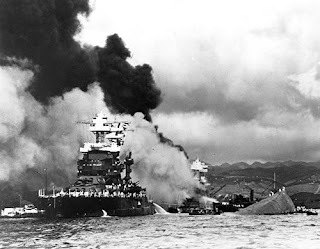 Are we to believe that shortly after an explosion that killed more than 200 servicemen and sank several landing craft that were about to leave for an invasion, that an enemy submarine was discovered amongst the wreckage and nobody paid any attention to it? Photos of this fifth sub have been released, and it has clearly been disassembled into its three component parts - as opposed to being randomly torn apart during a salvage operation. So, the sub was not simply hauled away with other rubbish without ever being identified, which is the theory being put forward. Why has the Japanese photograph purportedly showing this sub firing its torpedoes at "Battleship Row" only "recently" been declassified? All of the other Japanese photos taken during the attack were released a long time ago. This looks like a cover-up by the Navy. Keep in mind Pearl Harbor was a Navy base that was protected from air attack by the Army (Air Corps). Those fighters on Hickam Field and on surrounding air bases were all Army Air Corps fighters. The Navy was responsible for defending the base from attack by sea. Looks to me like the Navy wanted to say it did its part and prevented all of the mini subs from causing any damage while the Army failed to protect the base from air attack. It now looks like the Navy failed to stop one of the five mini subs and didn't want anyone to know.